Host Annie Barrows to speak at your event! 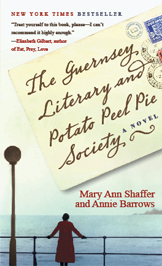 Guernsey author Annie Barrows is now being represented by the Random House Speakers Bureau! So if you’re interested in hosting Annie for a conference, a lecture, or any kind of event, click here for details. Did you meet the author? Send us your photos! Were you one of the hundreds of people who attended one of Annie Barrows’ book events this month? Email Guernsey@randomhouse.com with any photos you took and we’ll post them on the site!